Yes, You can Learn to Wakeboard for only $5 ! This is for newbies only! 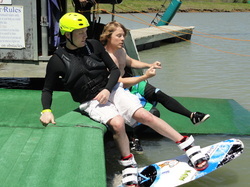 KC Watersports wants to help as many people as possible learn to wakeboard! Never been able to get up on a wakeboard? Can’t stay up once you do get up? It is really pretty simple, if you are a beginner wakeboarder sign up for one of our "ride for five" lessons. Bring your swim suit and $5. We will provide everything else you need! We will have instructors and coaches on hand to teach you the basics. How to start off the dock, how to successfully get around the lake, and most important, how to have a great time doing it! C U on the WATER! Be sure to take advantage of the dates below for the Ride for $5. These are the last 3 dates for this program for the 2011 season! Sunday Aug 21st CLASS IS FULL! Once you make it around the lake without falling….. you will be finished with the “Ride for Five” program and we will get other beginners started! Space will be limited so that we can spend the necessary time with beginners to get them comfortable riding the cable!